← Mirror’s Edge Catalyst: A Libertarian Game Review! 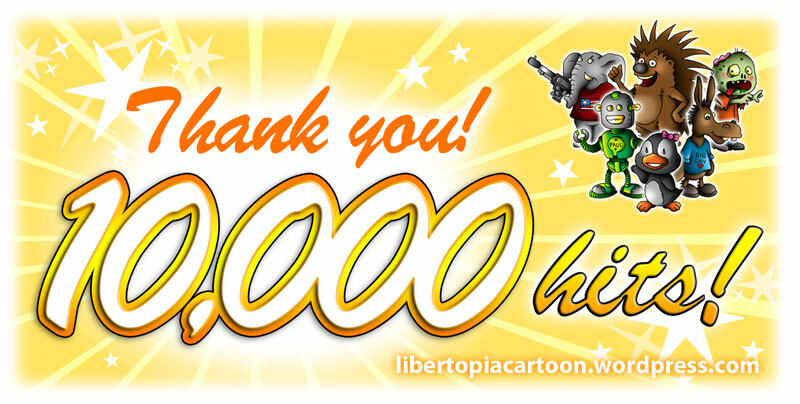 10,000 Hits: Onwards and Upwards! 10,000 Hits! Onwards and Upwards! Since we started Libertopia Cartoons in December of 2014, we’ve seen a lot of growth over the past year and a half. For example, do you remember when we hit the “5,000 hits” mark just six months ago? Well, we just recently crossed the “10,000 hits” milestone! Wow! We’re excited at how we’ve been able to help spread a fun message of libertarianism through a number of creative ways, often through a visual medium that’s designed to reach out to a variety of audiences. So to celebrate this achievement, we thought we’d take a look at some of the great stuff we’ve been able to be a part of over the past six months! As always, many of our cartoons and infographics have already been used to help convey a fun and unique liberty-themed message throughout the world (read more under our “About” section)! Plus, we’ve been hard at work creating artwork and designs for many different libertarian activists and organizations within our community (like the Jason Stapleton Program, Tony Stiles, Liberty Ninjas PAC, Austin Petersen, Contra Krugman Podcast and much more)! You can read all about it at Need An Artist? We’ve also recently had some great interviews with Artist Paqui Romero and Podcaster Jeremiah Mitchell. And in May of this year, we had an amazing art contest with a number of very cool artists who submitted work. You can check out the winners at 2016 Libertarian Art Contest! And last (but not least), we’re also really proud of our 60 page art ebook we released recently at Libertopia: Collection One! A Call for Libertarian Creatives! Are you a libertarian creative who would like to be a part of our growing community? Just send us an e-mail at silverlake37 (at) outlook (dot) com, or leave a comment below! Please include a link to your portfolio or blog site, and any particular work you would like us to check out. Thank YOU! A BIG thank you to our readers and those who have helped contribute awesome content to this site. We also would like to extend a special “thank you” to Julie Wilder (who helps us out on facebook). We couldn’t have done it without all of you! This entry was posted in Uncategorized and tagged art ebook, artwork and designs, Austin Petersen, Cartoons, community, Contra Krugman Podcast, fun message, infographics, Jason Stapleton Program, Libertarian, libertarian activisits, Libertarian Art, libertarian art contest, libertarian creative, libertarianism, Libertopia, Liberty Ninjas PAC, liberty-themed, Paqui Romero, Tony Stiles, visual medium. Bookmark the permalink.